A Mom with a Blog: Perfect little devotional for women! "LOL with GOD" is a great little devotional to add to my daily Bible reading. I like to arrive early to pick my children up from school each day... it gives me some much needed alone time and allows me to read my Bible (I keep a small one under my car seat). 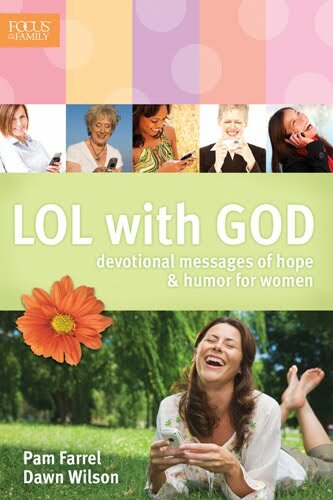 So I've added "LOL with God" to my Bible reading time. It's perfect for me. It's light-hearted, fun, encouraging. Not at all meant to take the place of Bible study itself... but it does give me a little lift in my spirit. Helps me set the mood before starting the rest of the day with my kids. Each devotion includes a Bible verse, a short story related to the verse, a prayer to follow with other scrtipures and then is followed by an "LOL"... a short story that will most likely put a smile on your face. Anyway, I enjoy this devotional very much. It's well written and full of humor. I love these ladies! As a bonus... this book has a lot of fun 'texting' info. LOL... for example. I try to keep up with technology as much as I can (Charles Stanly's advice for staying young... I need all the help I can get! LOL). So, while some of the verses were hard for me to decipher in the 'text' lingo, it was fun trying to figure them out. They do give the original verse at the bottom of each page to make it easier. So there you go! Some great lessons shared with Biblical truth, by a couple of women just like us... sprinkled with a little humor to help keep us pointed in the right direction. I enjoyed it! I hope you will too!